The Soft Hackle Charlie is a variant of the classic soft hackle wet fly. 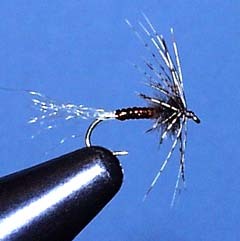 The classic soft hackles are typically tied with silk floss for the body. When it gets wet, it darkens and turns translucent as are the bodies of aquatic insects. According to various sources, just the right kind of silk floss is: A. very hard to find, or B. no longer made by the manufacturer who sells and inferior substitute. Rather than struggle with this I took the translucent body of Crazy Charlie bonefish fly, which is Krystal Flash over wrapped with Vinyl Rib or similar materials. I cribbed The trailing shuck of Antron, Zelon or similar from soft hackle guru Sylvester Nemes' book Soft Hackled Fly Imitations. Actually the Charlie is a tying style with possible color variants. So far, I have used brown and olive versions with considerable success. I have done well with these flies especially in the smaller sizes on the Firehole and Madison in Yellowstone and the Henry's Fork last September, and then at Hat Creek and Hot Creek in California in October. Lately the concept of a "royal" version occurred to me so that's included, although not tested. hook: 14-20 dry or wet fly, normal length. hackle: brown partridge or hen. Pantone marker, over wrapped with amber Vinyl Rib (small). thorax: brown or gray ostrich herl spun in a dubbing loop. hackle: gray or dun hen. marker, over wrapped with olive Vinyl Rib (small). thorax: peacock herl spun in a dubbing loop. hook 14-20 dry or wet fly, normal length. There are a couple of subtleties to tying soft hackles which make them look if not fish better. But looking better gives you more confidence in fishing a fly you've tied, so it's really the same. Here are my methods. Strip the fluff off the base of the hackle feather. Tie it in on top with the concave side of the curve of the shaft up. All the base fluff is stripped off, and most of the barbs on the side in the wrapping direction. You can leave a few barbs at the top to grab with the hackle pliers. Stripping the side like this makes it much easier to get the "look", standing out but slightly curved back fibers. I like to tie in the hackle as a first step, and wrap it as the last before tying off. I have the thread behind when I wrap the hackle, I wrap the thread forward through the wound hackle several turns to reinforce it. Since one side is stripped, about three, possibly four turns of the hackle is about right. Other literature on soft hackles suggests one and a half or two, but this is for hackles not stripped on one side. The length of the hackle fibers should be around the length of the hook shank, but it's not too critical. The overall esthetic for soft hackles is s-p-a-r-s-e-n-e-s-s. Less is more. I tie in the Vinyl Rib just behind the hackle stem and bind it down with thread to opposite the hook point. As I bind, I pull on it which thins it a bit. This helps keep the body cross section uniform and tapering a bit towards the tail. There I tie in the shuck fibers (sparse!) and a strand of Krystal Flash. I take the thread 3/4 of the way back, wrap the flash with no gaps to the thread and tie it off. Then I paint the flash in the case of the brown or olive variants. This tones down the flashiness and, when over wrapped with the vinyl, gives a rich translucent segmented bug body look of these colors.. This is what I think makes it so effective. So here wrap the vinyl to the same point as you did the flash. Take care not to get a lump at the back when you start to wind the vinyl. At this point I do a herl thorax. 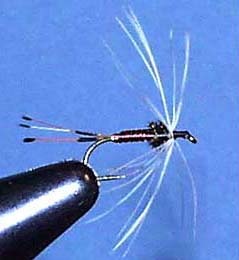 I tie both ends of a single herl to the hook and then spin the doubled herl in a dubbing loop. I wrap three or four turns more or less on top of each other. The inner turns are squashed but the overall effect is to bulk up the thorax so the hackle fibers are held out a bit so they wave enticingly in the current rather than folding down tight against the hook. At this point I wrap the hackle as described above. It may take a turn or two of thread up against the front of the hackle to restrain an errant fibers from tilting forward, but you don't want to bind them down so they're tilted backwards. I wrap a bit of a head and whip finish. My variation on the whip finish is to heavily coat the thread with beeswax and to do two three turn finishes. As I draw up the whip finish, the wax melts from the friction and lubricates the setting of the knot and then sets, locking it. That way I don't need head cement. 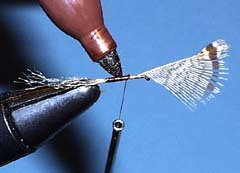 Variant Materials: Larva Lace and other similar materials in the smallest sizes (even last years tippet) is fine in place of the Vinyl Rib. Likewise there is a variety of suitable stuff to use for the shuck. Various varieties of hen hackle and game bird hackles will work. Pheasant "church window" feathers look really cool spun, but small enough, well marked ones are hard to find. Hackles for 18 and 20 size take a really delicate touch to wind without breaking. Dry fly hooks are what you want to use if you want to play the emerger in the surface film game, while wet fly hooks help a deeper presentation. The number one way is the classic wet fly swing. Cast it across and let it swing with the current. A bit more sophistication calls for mending the line so the fly is not dragged by the line, but moves at more like speed of the current. 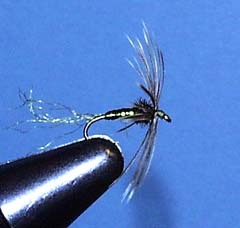 But with soft hackles, especially subsurface, drag isn't nearly the issue it is with dry flies. You can also usually get away with a considerably heavier tippet than with dries. I won't go into a lot of detail here. See Sylvester Nemes' books, Soft Hackle Flies, The Soft Hackled Fly Addict, and Soft Hackled Fly Imitations. I also recommend Dave Hughes' Wet Flies. I believe these are all in print as of the writing of this in January '99.